5. 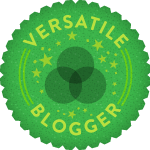 Add the Versatile Blogger Award picture to your post. 7 random facts about Myself. 1. I love One Direction. 2. My favorite ice cream flavor is Vanilla. 3. The first book I ever read was by Enid Blyton. 5. I am deathly scared of lizards. 6. Purple is my favorite color. 7. I keep a diary, where I write my favorite quotes. And congrats on yours as well! You and I have a few things in common: favourite colour and favourite flavour ice-cream!! Many thanks again for the nomination. Am on holiday at the moment with my folks, but will get on the case when I get home again. Wow. Thanks for nominating me! And congrats for being nominated!